Situated in the mountainous interior of Vancouver Island, Strathcona Provincial Park gives views to the open Pacific to the West, and Georgia Strait and the British Columbia mainland to the East. Alpine meadows of heather, lupine, monkey flowers and indian paintbrush burst with colour in summer and wild blueberries fringe sub alpine lakes. On its western fringes, the clear green salmon streams of the Megin and Talbot Rivers empty onto the West Coast. Its rugged peaks, rising to 2200 meters, capture huge amounts of moisture as winter storms pummel the North Eastern Pacific Ocean. The highest waterfall in Canada, Della Falls, cascades 440 meters out of the mountains and into one of the clear deep lakes that fill the valley floor. For its rugged beauty, Strathcona Park (250,000 hectares) has been called a mini-Switzerland, although the heavy precipitation, thick forests, marine influence, and climatic diversity make the area a unique Vancouver Island experience. Snowfalls are amongst the highest recorded anywhere in the world and the gleaming white of the ice fields and high snow capped peaks are visible year around. On an island ravaged by the effects of industrial logging, the park is a repository for old-growth forests, including fir, hemlock, yellow and red cedar, spruce and maple. The park provides habitat for wolf, black bear, cougar, elk, marmot, deer and numerous other species. Unlike the mainland of BC, there are no grizzly bears on Vancouver Island. Big Den, Central Strathcona and Comox Glacier - three road-less tracts within Strathcona Provincial Park - have been designated as nature conservancy areas. Each tract contains outstanding examples of scenery and natural history that remain uninfluenced by human activity. The three areas, totaling 122,500 hectares, are dedicated to the preservation of the undisturbed natural environment. Forbidden Plateau is mostly contained within Strathcona Provincial Park. Peaks rising from the plateau include Mt. Brooks (1500 m) and Mt. Albert Edward (2090 m), the fourth tallest mountain on Vancouver Island. To the west, the mountains of the main Buttle-Comox divide form one of the longest and highest sections of alpine terrain on Vancouver Island. Through combination of volcanic and tectonic forces, Vancouver Island rose and separated from the mainland of North America millions of years ago. The last of many ice sheets that covered the area disappeared only a few thousand years ago, and the effects of glaciation, from deep narrow lakes, to erratic boulders and scoured rocks, exist throughout the park. Designated in 1911 by a special act of the Provincial Legislature, Strathcona Provincial Park is the oldest park in British Columbia. The park is named for Donald Alexander Smith, First Baron Strathcona and Mount Royal, a Canadian pioneer and one of the principals in the construction of the Canadian Pacific Railway. In 1995, after an enourmous effort by environmentalists, the Megin/Talbot watersheds were added to the park. Strathcona Provincial Park is unique in that it incorporates a working mine, the Myra Falls Operation of Boliden-Westmin Resources Ltd. It produces ore containing zinc, copper, gold and silver and has a capacity of 1.4 million tons annually. Native legend has it that supernatural spirits dwell at Forbidden Plateau. Historically, when the Comox faced raids from other coastal tribes, they took their women and children to the plateau for safekeeping. On one occasion, during a raid from the Cowichan people, the women and children disappeared and were believed consumed by evil spirits. The area became taboo. While the Coast Salish people regarded the high country with caution, colonists in the early 1900s quickly saw the potential for recreation on the plateau and the mountainous interior of what is now Strathcona Park. By the 1920s, a well-worn horse trail led from Bevan, near Cumberland, up to Forbidden Plateau. A few cabins were constructed and camps dotted the picturesque alpine during the summer months as local outdoors people and visitors came to explore its beauty. The ski lift area that operated on the flanks of Mt. Becher shut down in 1999 after the day lodge roof collapsed from the heavy snow load, leaving this corner of the plateau quiet again. Kayakers and canoeists paddle from the west coast to access the Megin river, or take long excursions on the waters of Buttle, Campbell and Great Central lakes; white-water enthusiasts can paddle rain-swollen rivers; fisherman pursue steelhead, rainbow and cutthroat trout; while hikers, rock-climbers, campers, cross country and back country skiers can all pursue their passions in this area of sublime beauty. Buttle Lake and vicinity and Forbidden Plateau offer a variety of visitor-oriented developments. The rest of the park is largely undeveloped and appeals primarily to people seeking wilderness surroundings. To see and enjoy much of the scenic splendor requires hiking or backpacking into the alpine regions. All trails in Strathcona Provincial Park are closed to mountain bikes and horses and pets must be leashed at all times. In the fall, clear skies and mild temperatures can be followed by heavy overnight frosts. Although mild compared with most parts of Canada, winter brings heavy rain, snow and low visibility, or cold, clear days as artic air spills down from the North. Spring comes very late to the mountains and campers should be prepared for soggy ground. Summertime usually brings unbroken weeks of warm sunny weather to Vancouver Island. However, the rivers and lakes of Strathcona are cold throughout the year, precipitation is likely, and temperatures can drop to single digits even in July. The cities of Campbell River and Courtenay are the primary access points to Strathcona Provincial Park. Highway 28 passes through the northern section of the park and provides access to Buttle Lake, 48 kilometers west of Campbell River. Paradise Meadows (Mount Washington): from Hwy. 19 follow signs to Mount Washington Resort via the Strathcona Parkway. 25 kilometers up the Parkway you come to the resort's Nordic Lodge road on the left. Go another 1.5 kilometers to Paradise Meadows parking lot. Forbidden Plateau (Wood Mountain): Follow the signs to Forbidden Plateau road and travel 19 kilometers to the parking lot of the old Forbidden Plateau ski area. By canoe and kayak, water access is possible from Clayoquot sound and shelter inlet. Floatplanes provide some service into the park. Bedwell Lakes: Roadwork was completed in October 2007 and access was restored to the trailhead. Heavy snow accumulations could restrict winter access. There are two main road-access campgrounds: Buttle Lake (85 sites) and Ralph River (76 sites). Both are located on Buttle Lake, accessed by Hwy. 28 (the Gold River Hwy.) west of Campbell River. The campgrounds have water, toilets and firewood. Backcountry users are permitted to camp one kilometer from main roads or, where provided, at designated sites. 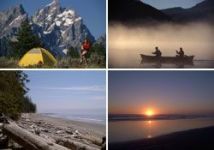 Four marine backcountry camping areas are located on the western shore of Buttle Lake and one on Rainbow Island. Outdoor enthusiasts moving away from the few established road access points can camp throughout the park. They should be thoroughly prepared and self-reliant. Domestic pets must be leashed and under control and are prohibited from the designated Nature Conservancy areas. Elk River, Marble Meadows, Phillips Ridge, Flower Ridge, Upper Myra Falls, Bedwell Lake. Lady Falls, Elk River Viewpoint, Lupin Falls, Auger Point, Karst Creek, Wild Ginger, Shepherd Ginger. From Forbidden Plateau Road and old lodge parking area, hikers and skiers can climb the decommissioned ski runs and access the Mount Becher Trail, or continue on the Dove Creek Trail across McKenzie meadows to Paradise Meadows and the village base-area at Mt. Washington Alpine Resort. Alternatively, hikers and skiers may access Paradise Meadows Loop Trail, Helen McKenzie-Battleship Lake, Mount Albert-Edward. Moat Lake, Amphitheater Lake, Mount Albert Edward. Contact Name: R.L.C. Enterprize Ltd.